How can you plan a wonderful celebration for the most important day in a couple’s life—without overspending? It used to be that parents paid for a daughter’s wedding as a matter of course. But for better or worse—or richer or poorer—families and cultural norms have changed. Maybe that’s partly due to the high price tag for a ceremony with all the trimmings; now couples often pay for their wedding themselves while other family members chip in. The wedding industry takes in around $72 billion3 per year, but is that a good thing? Should a couple go “all-out” on an expensive wedding? Probably not. A study of more than 3,000 married couples in the U.S. by Emory University indicated that there is an inverse relationship between money spent on a wedding and whether or not the couple got divorced. How Can You Save Money Without Looking Cheap? At an average nationwide cost of $16,1071, the wedding venue came in as the most expensive element for couples planning their public display of long-term commitment. This has a lot to do with timing, because high demand means higher price. You don’t have to have multiple bridesmaids (they may be thinking they don’t want to buy a dress they’ll never wear again anyway) or invite a lot of guests you barely know (who may not want to buy a gift or a fancy new dress-up clothes in the first place). You really can keep to a small list of important people and have a heartfelt, special day with those you hold most dear—and create an incredible, irreplaceable memory. Plus, you can spend more per person and still keep the budget down. Rather than a full open bar, consider wine, beer and/or a few signature cocktails. And instead of expensive flower arrangements, you can keep the impact (but reduce the price) by choosing seasonal, large blooms that need minimal arranging, like sunflowers, hydrangea or Gerber daisies. Both of these ideas are on trend, but cost less. 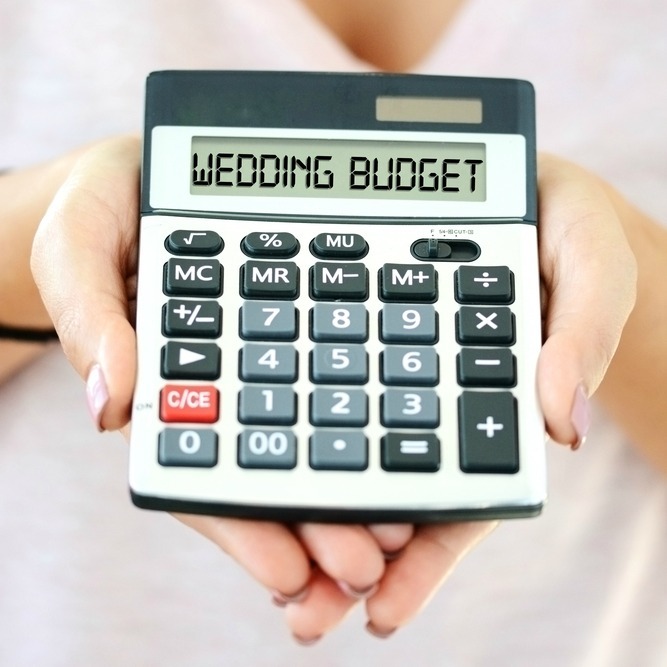 Look at every line item selection in the wedding budget closely. What is critical versus “meh”? For instance, how important is the wedding cake? Some couples have started renting wedding cakes, and purchasing tasty sheet cakes for actual serving. They stand behind the rental and pretend to cut it while feeding each other bites for their Instagram posts. If it’s absolutely non-negotiable that you save a piece of cake in the freezer to eat for your first anniversary, go ahead and splurge on the cake, but cut back on something else, like maybe the designer wedding dress or live band. If you would like financial advice for life events like weddings, college or buying a home, or need help planning for your retirement, call Alpha Beta Gamma Wealth Management at (866) 837-0999. 1 “This Is How Much It Now Costs to Get Married in the U.S. on Average.” http://fortune.com/2017/02/03/wedding-cost-spending-usa-average/ (accessed April 17, 2018). 2 “Average Cost of a Wedding (2017).” https://www.valuepenguin.com/average-cost-of-wedding (accessed April 17, 2018). 3 “The Wedding Industry in 2017 and Beyond.” https://blog.marketresearch.com/the-wedding-industry-in-2017-and-beyond (accessed April 17, 2018). 4 “When a Diamond Isn’t Forever.” http://squaredawayblog.bc.edu/squared-away/when-a-diamond-isnt-forever/ (accessed April 17, 2018). 5 “10 Easy Ways to Cut the Cost of Your Wedding.” https://greatist.com/live/cheap-wedding-ideas (accessed April 17, 2018). 6 “8 Real Brides Share One Thing They Regret Splurging On For Their Wedding.” https://www.brides.com/story/real-brides-share-one-thing-they-regret-splurging-on (accessed April 17, 2018).